Eo 12333 stories at Techdirt. stories filed under: "eo 12333"
That buzzing noise that never seems to leave the Intelligence Community's ears is Sen. Ron Wyden. Wyden's questions -- often unanswered -- are dog whistles for privacy advocates but ear-bleeding tinnitus for agency officials. Persistence is key in Congressional oversight and few are better at it than Wyden is. For years, Wyden has been asking how many Americans have been hauled in by the NSA's Section 702 dragnet. And for years, the NSA and ODNI have sidestepped the question. The surveillance bosses got close to returning an answer -- right before they announced they were shutting down the collection that netted the most Americans. Right before Trump was elected, James Clapper finally said he'd cough up the numbers. But with the regime change, the promise is no longer a promise. The NSA may try to keep this buried, using time and distance from the abruptly-abandoned "about" collection to stiff-arm additional requests for domestic surveillance data. Ever persistent, Wyden has returned with another set of questions [PDF] regarding NSA surveillance. This one pertains to the least-discussed surveillance authorization and the one almost everyone -- including members of oversight committees -- knows nearly nothing about: Executive Order 12333. Like Section 702, there's a good probability intelligence gathered under this authority is being used by domestic agencies. Backdoor searches of NSA intel have been unofficial common knowledge for years now, so there's very little reason to believe the NSA's most mysterious authority doesn't have its own built-in peepholes for the FBI and other federal agencies. Wyden is asking for details on this authority, specifically the number of times it has been used to surveil Americans. As he points out, the order allows the deliberate targeting of American citizens with the Attorney General's approval. 1. How many times, in each of the calendar years 2011-2016, has the Attorney General provided this approval? 2. Can the Intelligence Community conduct these searches "for the purpose of targeting a US. person or a person in the United States" without an individual warrant? 3. What limitations and approval requirements would apply to searches for communications that are reasonably likely to be to, from, or about a US. person or a person located in the United States if the purpose of the search is not to "target" that person? That's the "what." Here's the "why:"
Concerns about warrantless "backdoor" searches for information about Americans are among the reasons I have repeatedly asked the Intelligence Community to publish an estimate of the number of Americans whose communications have been collected under Section 702 of the Foreign Intelligence Surveillance Act (FISA). Concerns about these searches under Section 702 are also why the Intelligence Community now publishes data on the number of these searches, with the notable exception of searches conducted by the FBI. Executive Order 12333 poses similar, if not greater concerns, given the lack of public awareness of the breadth of that collection, extremely limited oversight, and the vagueness of the procedures governing collection and use. For these reasons, I believe the public has the right both to clarity with regard to those procedures and data related to the frequency with which Americans and individuals in the United States are the subject of these searches. No sense holding your breath. As much as I appreciate Wyden's effort, the current administration firmly believes surveillance might makes right. The Intelligence Community has been so emboldened by the administration's lack of concern for civil liberties it's already asked to have the "about" collection -- which it shut down voluntarily so it could finally get 702 orders approved by the FISA court -- turned back on. If any answers do appear, expect them to be vague and deliberately uninteresting. But at this point, it's probably less disappointing to just not expect them at all. The NSA's Bulk Collection Of Phone Records Ended Saturday. Long Live The Bulk Collection Of Phone Records! The NSA's frontmouth, the Office of the Director of National Intelligence, is burying news again. Not that it could help it. Normally, the ODNI likes to do its document dumps (most often consisting of documents ordered out of its hands by federal judges presiding over FOIA lawsuits) on Friday afternoons or shortly before a holiday to buy itself some response time before dealing with journalists and Congressional committees. In this case, it delivered its latest news on Black Friday, while most of America was either out shopping or covering the story of Americans shopping for the local newsjobber. The timing would be suspect if it weren't for the fact that the NSA's bulk phone metadata program ended (at least in this form) at 11:59 PM Saturday night. On June 2, 2015, Congress passed and the President signed the USA FREEDOM Act of 2015. The Act reauthorized several important national security authorities; banned bulk collection under Section 215 of the USA PATRIOT Act, under the pen register and trap and trace provisions found in Title IV of Foreign Intelligence Surveillance Act (FISA), or pursuant to National Security Letters; adopted the new legal mechanism proposed by the President regarding the targeted production of telephony metadata; made significant modifications to proceedings before the FISC; and built on the U.S. Government’s unprecedented transparency about intelligence activities. With respect to the new mechanism for the targeted production of telephony metadata, to allow sufficient time to implement a new system while at the same time avoiding any lapse in a national security program, the USA FREEDOM Act provided for a 180-day transition period during which the existing NSA bulk telephony metadata program may continue. The six months are up and so is the NSA's Section 215 collection. While this means phone records will be held where they've always been held (phone companies) and the NSA must now approach providers with FISA court orders, this does not mean the NSA will no longer be collecting phone records in bulk. It just means it won't be doing this under those particular authorities (Section 215, PR/TT provisions, NSLs). It still has plenty of options. [T]he overall volume of call detail records subject to query pursuant to court order is greater under USA FREEDOM Act. This could mean the new method (approaching phone companies directly) may give the NSA access to records it couldn't obtain under Section 215, like additional cell phone records or other communications methods like VOIP. In other words, the requests will be more targeted but capable of obtaining a greater variety of records responsive to the court-approved identifiers. As I've said before, I suspect the NSA was willing to let Section 215 provide bus traction for the administration's minimal surveillance reform efforts. As long as everyone kept worrying about the bulk phone metadata (subject of multiple lawsuits that are now basically moot as far as the courts are concerned), the NSA would be able to keep its multiple other, more intrusive programs intact. As Marcy Wheeler notes, this program may be dead, but it doesn't mark the end of the NSA's bulk phone records collection. They’re still collecting your phone records in bulk, not to mention collecting a great deal of your Internet records in bulk as well. The DNI himself, James Clapper, threw his weight behind reforming this high-profile but ultimately minimal part of the NSA's dragnet. That should have been indication enough that killing off the Section 215 program wouldn't severely limit the NSA's surveillance options, despite the occasional bit of FUD directed at legislators (or parroted by them). We recently noted that, despite it passing overwhelmingly, Congress quietly deleted a key bit of NSA reform that would have blocked the agency from using backdoors for surveillance. But this week something even more nefarious happened, and it likely would have gone almost entirely unnoticed if Rep. Justin Amash's staffers hadn't caught the details of a new provision quietly slipped into the Intelligence Authorization Act, which effectively "legitimized" the way the NSA conducts most of its mass surveillance. For a while now, we've discussed executive order 12333, signed by President Ronald Reagan, which more or less gives the NSA unchecked authority to tap into any computer system not in the US. Over the summer, a former State Department official, John Napier Tye, basically blew the whistle on 12333 by noting that everyone focused on other NSA programs were missing the point. The NSA's surveillance is almost entirely done under this authority, which has no Congressional oversight. All those other programs we've been arguing about -- Section 215 of the Patriot Act or Section 702 of the FISA Amendments Act -- are really nothing more than ways to backfill the data the NSA has been unable to access under 12333. In other words, these other programs are the distraction. 12333 is the ballgame, and it has no Congressional oversight at all. It's just a Presidential executive order. Backers of the section argue it would actually limit to five years the amount of time communications data could be kept at intelligence agencies, certain exceptions permitting. But it is generally acknowledged that such data is already rarely kept beyond five years, which Amash characterized as a trade-off that "provides a novel statutory basis for the executive branch's capture and use of Americans' private communications." "The provisions in the intel authorization appear to be an attempt by Congress to place statutory restrictions on the retention of information collected under Executive Order 12333, which is not subject to court oversight, has not been authorized by Congress, and raises serious privacy concerns," said Neema Guliani, legislative counsel with the American Civil Liberties Union. "However, these restrictions are far from adequate, contain enormous loopholes, and notably completely exclude the information of non-U.S. persons." This seems particularly nefarious. In trying to claim that they're putting a limit on this activity (that's already happening) they can claim that they're not really expanding the power of the NSA and the surveillance state. But, by putting it in law, rather than just having it in an executive order, they're effectively legitimatizing the practice, and making it much harder to roll back. And they did it all quietly without any debate. That's massively troubling. Inserting such a major power into the law at the very least deserves (and should require) a full and fair public debate about the issue and whether or not it is truly needed. Doing it in secret, at the last minute, with no public acknowledgement or discussion, and then pretending it's about "limits" rather than legitimizing what's in EO 12333 is really, really nefarious. "If this hadn't been snuck in, I doubt it would have passed," said Rep. Zoe Lofgren, a California Democrat who voted against the bill. "A lot of members were not even aware that this new provision had been inserted last-minute. Had we been given an additional day, we may have stopped it." This is the kind of crap that the intelligence community keeps pulling, and it's why there's so much that's troubling in the way they play the legislative game. Not only do they write the legislative language in sneaky ways that they can carefully interpret themselves -- they then get "friends" in Congress to quietly insert the language when no one's looking. By putting it in bills that have to pass, these things get put into the law and aren't at all easy to remove. The ACLU's FOIA lawsuit over documents related to the NSA's activities under Executive Order 12333 has knocked a few more pages out the agency's tightly-closed fist, most of which are related to its signals intelligence programs. 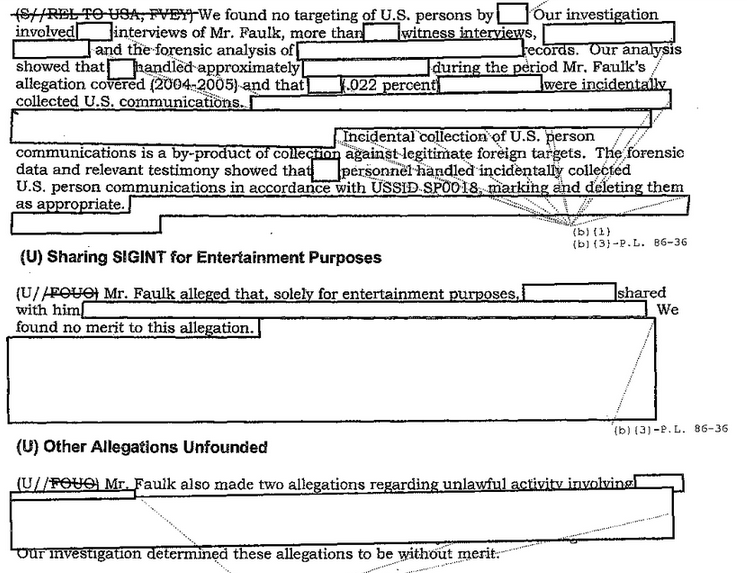 Included in the released documents is an 89-page Inspector General's report on the investigation of accusations made back in 2009 by David Murfee Faulk, who alleged that NSA linguists were listening in on the phone calls of military personnel, journalists and aid workers and sharing those containing "pillow talk" with other analysts. As for the accusations of NSA linguists and analysts listening in on phone calls of American citizens located overseas for purely prurient interests, the NSA's under-utilized Inspector General says there's no evidence this occurred. The report runs 89 pages, most of them completely withheld, but what little the NSA agreed to release indicates a lack of evidence to support David Faulk's accusations. There are 68 pages withheld in full (and five pages that are "intentionally left blank"), so any nuance has been left on the redacting room floor, along with any other evidence of wrongdoing. A memo from the Inspector General's office hints at other impropriety unrelated to the linguist's accusations. During the investigation of alleged improprieties at NSA Georgia (NSAG) in 2004 and 2005 and reported by a former NSA assignee in 2008, we identified some practices in [REDACTED] that are inconsistent with established NSA/CSS policies and procedures. For details concerning the investigation, see Report of Investigation Regarding Alleged Improprieties at NSA Georgia (Report of Investigation), IV-09-0003, August 14, 2009. These practices may increase the risk of mishandling U.S. persons information and, therefore, require your attention. Well, we have that report but we can't actually read most of it. There's hardly anything left but the IG clearing the NSA of the specific misconduct alleged by two NSA linguists. The IG memo lists other non-compliance issues like the dissemination of raw US persons SIGINT, as well as violations of reporting procedures and retention guidelines, but the specifics of the IG's findings remain hidden. I would imagine a legal challenge to the massive redactions in the Inspector General's report will be forthcoming. There's more self-interest than security apparent in the NSA's very selective exposures, making this exculpatory information highly conspicuous in its inclusion. Issued in 1981, updated in 1991 (to consolidate power, basically) and continuously expanded (mostly unofficially) since 2001, Executive Order 12333 (EO 12333) is what grants surveillance powers to our nation's intelligence agencies. In spite of the constraining appearance of all the requirements, under E.O. 12333, DoD Directive 5240 .IR, and DIAR 60-4, intelligence activities conducted by the DHS currently have much more latitude and potential for effectiveness than they have had for quite some time. Looks like "constraints" but in practice is hardly anything at all. Covert and clandestine operations ("Special Activities") -- normally limited to the CIA -- are now something any agency can participate in, if given permission to. The meaning of the proscription is not that intelligence components are prohibited from conducting all Special Activities; rather, that such activities must be directed by the President and approved by the Secretary of Defense and the respective Service Secretary. Going on from there, we see the first public instance of the government's redefinition of the word "collection." Procedure 2 introduces the reader of DoD 5240.1-R to his or her first entry into the "maze" of the regulation. To begin the journey, it is necessary to stop first and adjust your vocabulary. The terms and words used in DoD 5240.1-R have very specific meanings, and it is often the case that one can be led astray by relying on the generic or commonly understood definition of a particular word. For example, "collection of information" is defined in the Dictionary of the United States Army Terms (AR 31011 25) as: The process of gathering information for all available sources and agencies. But, for the purposes of DoD 5240.1-R, information is "collected" -... only when it has been received for use by an employee of a DoD intelligence component in the course of his official duties ... (and) an employee takes some affirmative action that demonstrates an intent to use or retain the information. "Collection" is now defined as "collection plus action," rather than the way it's been defined for hundreds of years. 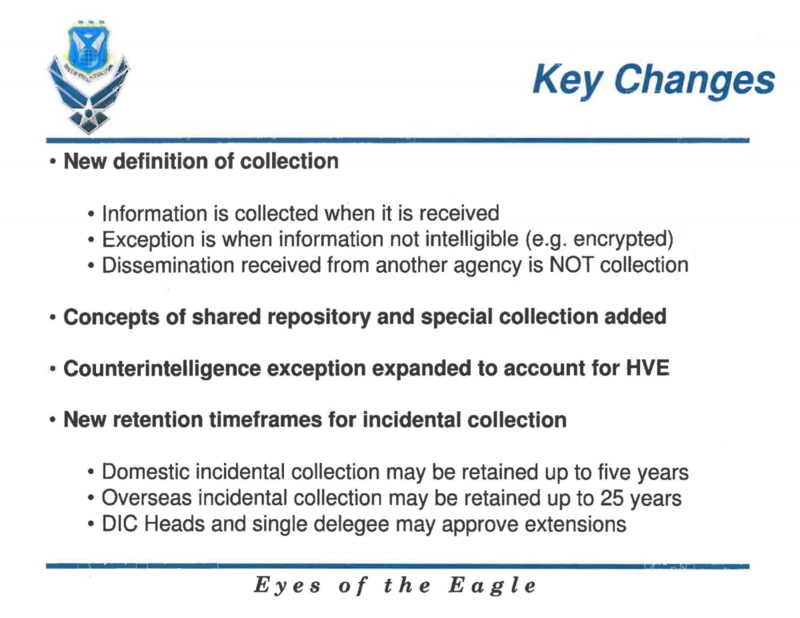 "Information held" is not a "collection," according to this document. It still isn't collected, even if its been gathered, packaged and sent to a "supervisory authority." No collection happens until examination. It's Schroedinger's data, neither collected nor uncollected until the "box" has been opened. This leads to the question of aging off collected data/communications: if certain (non) collections haven't been examined at the end of the 5-year storage limit, are they allowed to be retained simply because they haven't officially been collected yet? Does the timer start when the "box" is opened or when the "box" is filled? Also of note: "incidental" collections are not collections if utilizing the same mental gymnastics. If the information is not essential to the mission of the component and it does not fit into one of those categories, then that information may not be collected. However, you will recall from our discussion in paragraph 3 -7 that "collection" means receiving plus an affirmative act to use or retain the information. Therefore, mere receipt of non-essential information does not constitute a violation of DoD 5240.1-R.
Once again, we must cautiously examine the vocabulary used in DoD 5240.1-R. The term "retention" means more than merely retaining information in files - it is retention plus retrievability. As stated in DoD 5240.1-R -... the term retention as used in this procedure, refers only to the maintenance of information about United States persons which can be retrieved by reference to the person's name or other identifying data. Somewhat more positively, this section instructs analysts to a very limited view of "retrievability" and err on the side of "purging" information on US persons that cannot legally be retrieved, even if it was legally "collected" (using the DoD's expanded definition). It does, however, hedge by noting information "necessary to ongoing missions" should be retained. The document goes on to applaud the FISA court for being instrumental in protecting citizens' rights… apparently by eliminating legal barriers to domestic surveillance. The [Senate Select] Committee has reviewed the five years of experience with FISA and finds that the Act has achieved its principal objectives. Legal uncertainties that had previously inhibited legitimate electronic surveillance were resolved, and the result was enhancement of U.S. intelligence capabilities. At the same time, the Act has contributed directly to the protection of the constitutional rights and privacy interests of U.S. persons. There's a lot of information in there, very little of it redacted, but until the ACLU liberated it, completely withheld from the public. The question is, why? Despite the many paragraphs given over to rewriting the English language to better suit intelligence agencies' aims, there's also a lot of very blunt statements made about the balance between the government's counterterrorism efforts and the rights of US citizens. The ACLU highlights this particular section in its write up of the released documents. 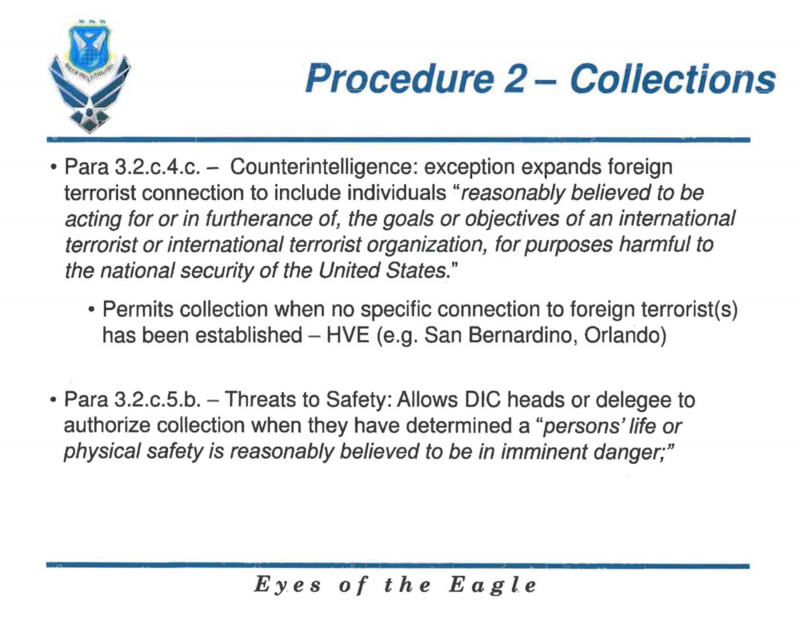 This area of DoD intelligence activities, that is, the use of special collection techniques, is the area in which there tends to be the greatest amount of confusion regarding the limitations on permissible activities. Because of this confusion, this area also tends to be the most fertile ground for both abuse and unnecessarily restrictive interpretation of the rules. To be sure, it is fundamental that abuse of the legitimate DoD intelligence and counterintelligence resources and authority must be avoided. The rights of US persons must also be protected, and no intrusion into these protected areas is permissible without first meeting constitutional standards, and then only through a system of careful scrutiny of the intruding apparatus. This is spelled out more explicitly later, reminding those entering the intelligence world that the job is necessarily difficult -- a fact many of those in the intelligence and law enforcement fields forget all too quickly. The system is complex, but it is not impossible. Its underlying structure is designed to balance the legitimate needs of the government with the rights of the individual. Given those constraints, one could not expect a system to exist which did not inherently contain adequate checks, balances, and oversight procedures. This is miles away from the DOJ's statements that cell phone search warrant requirements make it too difficult to capture criminals, a refrain now being echoed by law enforcement agencies in response to automatic encryption on iPhones and Android devices. These are the limits these entities must adhere to. These are built-in as a check against government power. But these rights are not a one-way street solely favoring the American public. The DIA guidebook discusses what the intelligence community and the administration have refused to: and it does it in plain, straightforward language. Nevertheless, we must be mindful of too much caution. We must remember that we are engaged in a real-world mission that involves unprincipled adversaries, and a plethora of sophisticated technical collection and counter-collection enterprises and devices. Terrorism and have destruction as their common denominator, and we are fueling their malignancy when we unnecessarily restrain or restrict our foreign intelligence or counterintelligence efforts, just the same as we would damage the fiber of our democracy through abusive use of our own capabilities and powers. Our business is one that involves constant vigilance and omnipresent balancing of competing interests. To survive, we must take risks. To succeed, we must minimize those risks. To preserve our precious ideals, we must carefully pursue our crafts in such a manner as to not offer up the rights and dignity of our citizens in exchange for that success. As the ACLU points out, this frank discussion of the tension between the two is a far cry from the usual "dissembling and obfuscation" the government has provided so far in its tepid responses to leaked documents. This willingness to discuss the balance in real terms may be part of the reasons a lawsuit was needed to free the document. The other, larger issue, is that this order may be the main justification for most of the NSA's surveillance and data dragnets -- an order not subject to any form of oversight. Because the executive branch issued and now implements the executive order all on its own, the programs operating under the order are subject to essentially no oversight from Congress or the courts. That's why uncovering the government's secret interpretations of the order is so important. We've already seen that the NSA has taken a "collect it all" mentality even with the authorities that are overseen by Congress and the courts. If that history is any lesson, we should expect — and, indeed, we have seen glimpses of — even more out-of-control spying under EO 12333. For all of the tough talk about respecting the public's rights, a vast amount of surveillance occurs under this order. In the document, any questions about overriding civil liberties concerns are directed towards members of the Executive branch, rather than to anywhere that might act as a check against its powers -- like courts or the legislative branch. In fact, the legislative branch has done nothing but expand its powers of the last 30+ years. So, new analysts might hear plenty about the importance of respecting civil liberties, but they'll find that in practice, those words -- like "retention" and "collection" mean next to nothing. The latest version of the USA Freedom Act is still on the boards, representing a big improvement in somewhat limiting NSA bulk surveillance on Americans. It's not great, but it's a step in the right direction, which would be more than has happened in decades. That said, never underestimate the ability of people spewing FUD. Senator Saxby Chambliss, one of the biggest kneejerk defenders of the surveillance state, has apparently decided that this minor curtailing of bulk surveillance efforts will help ISIS and therefore we shouldn't do it. This is the logic of fear, because it has no basis in reality. Most of the USA Freedom Act is about whether or not the NSA can do bulk collection of records in the US on US persons. It has no impact on Executive Order 12333 where most ISIS surveillance is almost certainly taking place. In short, there's nothing in the USA Freedom Act that has any real impact on ISIS surveillance. Basically, you just have surveillance state defenders using the most convenient bogeyman, in this case ISIS, to seek more power for the surveillance state, logic and reality be damned. The whole thing is just a cynical ploy to defend the surveillance state at all costs. But, under that idiotic logic, we might as well do away with the 4th Amendment altogether. Hell, why not just mandate that every human being in the US walk around with a camera and microphone recording everything they say and do -- all automatically shipped off to NSA headquarters at Ft. Meade for analysis? That might help stop ISIS. Just like collecting all phone records might. But in all reality it won't. At all. So it's a cowardly, shameful FUD suggestion from a cynical Chambliss. He's not looking out for the American people or their rights. He's looking out for the surveillance state. Leahy himself dismissed such claims. That's a message that doesn't seem particularly popular among surveillance state defenders. It seems likely that the eventual answer from Brennan to Wyden will basically point to this particular language. But that's not particularly important, as the intent of the question likely had little to do with actually looking at the scope of the CFAA, but rather hinting very strongly that the CIA is hacking into computers in a manner that would violate the CFAA if it wasn't being done by law enforcement. Got that? He was asked "do you spy on Americans?" and the answer was "we follow the law." Considering that Wyden and Udall have been among the leading folks pointing out that the intelligence community has regularly reinterpreted the laws in secret in order to broaden their claimed authority, that answer is hardly assuring. Instead, it sure sounds like the CIA admitting that, hell yes, they spy on Americans under their twisted interpretation of the law. Combine that with Wyden's question -- which may or may not be about the same issue, but the two have often coordinated on these issues -- and it certainly hints at the idea that the CIA is hacking into Americans' computers. Over the last few months, much of the focus has been on the NSA, but it's important to remember that the CIA actually is bigger in terms of its budget, and remains incredibly powerful and secretive. Also, over the last decade or so there appears to be significant evidence of incredible abuse by the CIA. As we've noted a few times, the Senate Intelligence Committee has been sitting on a supposedly explosive report that cost $40 million to put together, detailing some horrific CIA abuses, which the CIA has been doing everything possible to stop from being released. Given all this, how long will it be until we discover "explosive" revelations about the CIA that confirm what Wyden and Udall have been hinting at?